I saw this on the way to work this morning. It's a sundog. They usually come in pairs, but, because I was driving, albeit slowly to get the photo, I couldn't look around to see if there was one on the right side of the sun. They form when ice crystals in the atmosphere react like prisms when the light passes through them. They are limited to cold weather and it was 12 degrees this morning. We've come through some very gray days. The end of January was almost 2 weeks of clouds as weather system after weather system passed by, usually north of us. I can see why seasonal affected disorder takes hold. That many days without sunshine is oppressive. I don't care that it's cold. 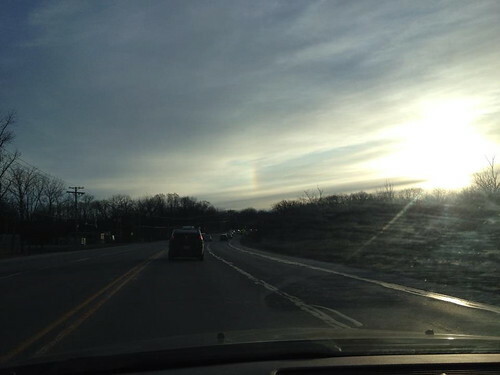 There's sunshine and a mini-rainbow. It's gonna be a great day.